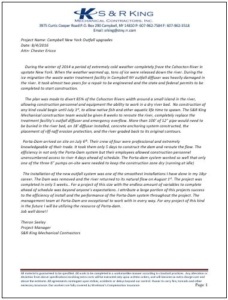 "The efficiency in not only the Portadam system but their employees allowed construction personnel unencumbered access to river 4 days ahead of schedule." Theron Seeley (S&R King) commented "The installation of the new outfall system was one of the smoothest installations I have done in my 18yr career. The dam was removed and the river returned to its natural flow on August 1st. The project was completed in only 5 weeks. For a project of this size with the endless amount of variables to complete ahead of schedule was beyond anyone’s expectations. I attribute a large portion of this projects success to the efficiency of install and the performance of the Portadam system throughout the project. "The crew was very good at what they did and impressed us greatly." Kyle Maher (Minnesota Power) commented “the crew that installed the Portadam last week up here in Ely, MN did a great job for us. Ken Baxter [Supervisor, Portadam] and his crew were honest on what we needed and worked very efficiently to place the Portadam. "Thank your firm for a job well done!" Richard Feliciano (Corman Construction) commented “I wanted to take a moment to thank your firm for a job well done at our Korah III water Line project along the James River. As always Corman can count on Portadam to perform their work in a timely manner to our satisfaction. "Prime example of effectiveness --completed 10 days ahead"
The work in the field, inspected by Calan Wilcox (AECOM formerly URS) and monitored by David Miller (BP), was a prime example of the effectiveness of BP’s OneTeam principle. Multiple firms of various specialties and backgrounds came together to safely execute work, given the nature of the scope and variant weather conditions. These activities complied with our permits, BP’s safety policies, and in addition were completed ahead of schedule, enabling us to repair this site 10 days ahead of our deadline date.